When the College moved downtown to the 950 Main Street campus in 2002 planners dubbed the 11th floor “music and arts central” for good reason. Capital’s top floor houses a music classroom, art studios and the art-deco auditorium known to generations of G. Fox shoppers as Centinel Hill Hall. Seven years later “music and arts central” at Capital is gaining stature as a Hartford cultural venue with free concerts, performances and art exhibits – events that complement a growing fine arts curriculum in the Humanities department. The College is adding value to a downtown district that it shares with cultural neighbors of tremendous importance and value – Hartford Stage, The Bushnell, City Arts on Pearl (TheaterWorks), the Charter Oak Cultural Center, the Wadsworth Atheneum and the Public Library, among others. For the visual arts, Associate Professor Pedro Valentin is consistently putting together impressive shows at the Conrad L. Mallett Gallery – the exhibit space on either side of the main entrance to the College with windows on Main Street. Recent examples: Hartford native Amy Archambault with a selection of her paintings; Photographer Juan Fuentes-Vizcarrondo capturing Puerto Rican life in Hartford through the years and the works of Bloomfield’s Stanwyck Cromwell. Through its exhibits the Mallett Gallery celebrates Hartford’s and the College’s diversity in a way that bring people from different backgrounds together. 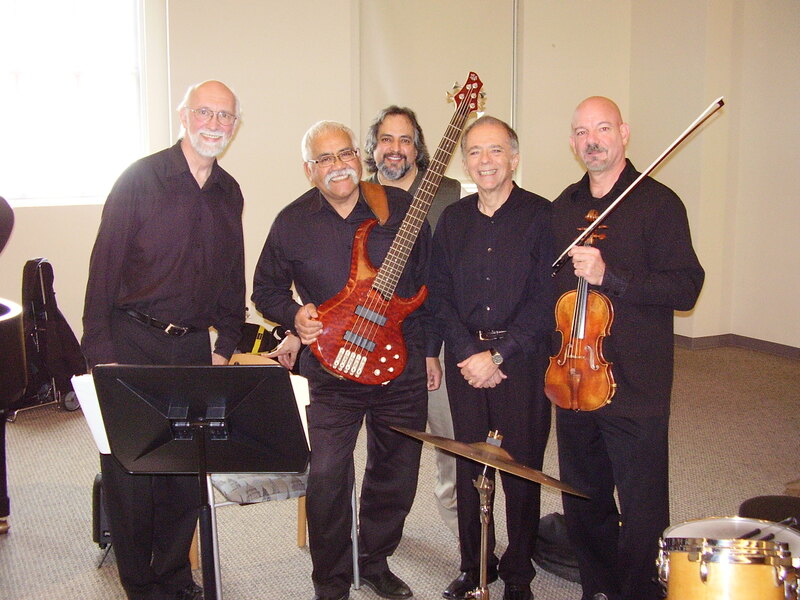 Members of HSO's jazz quartet with Prof. Art Hernandez at Centinel Hill Hall on November 19th. The series kicked off October 29th with The Alturas Duo in Concert. It continued with the “Hartford Peace and Unity Hip Hop Festival on November 11th and pianist Ira Braus on November 19th. The Hartford Symphony Orchestra’s Classical Jazz Quartet served up a pre-Thanksgiving lunchtime set on November 19th. These concerts, free and open to the public, go hand in hand with the recent approval of a music industry associate in science degree program this fall. In 2010 students at Capital can become music majors, gaining a comprehensive knowledge of the music industry, from managing musical artists and institutions to producing professional quality studio music. In 2010 we can look forward to more “Concerts @ Capital and Gallery exhibits thanks to the persistence and efforts of Professors Hernandez and Valentin who are bringing “music and arts central” to a new level. This entry was posted in Uncategorized and tagged Humanities. Bookmark the permalink.